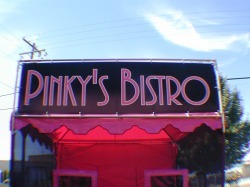 Banner frames can be added to any side of your Food Booth Tent or Vendor Tent to give you a great area for advertising. Standard signs size 3' x 10'. The banner frame attaches to the tent leg with a sleeve that slides onto the legs. You have the ability to raise or lower your sign for the best viewing at your location. This is a great choice if you are serving multiple styles of food and have different banners for multiple events. With the banner frame you can keep the tent unbranded and then customize with banners for different food options and festival themes. Cement weights are available for anchoring your tent when standard staking is not allowed. Each weight is approximately 65 pounds. The weights are designed for the leg to slide down through the center of the weight and then the bolt is tightened down to secure the legs. Vinyl covers are also available if you are looking for that extra color touch. Weights can also be painted to match your booth colors. Storage bags are available for small tents to protect top and walls as you transport your tent. Ask your salesperson for additional information.